Can't find your contacts on iPhone now and even have no backup files? Don't be panic and upset. Plenty of iPhone users experience contacts losses just like Leo; the situations are perhaps accidentally deletion, iOS upgrade, system crash, factory reset, water damaged and more. In order to downright fix your disheartening problem, one guide on how to recover iPhone contacts without backup is shared as below. 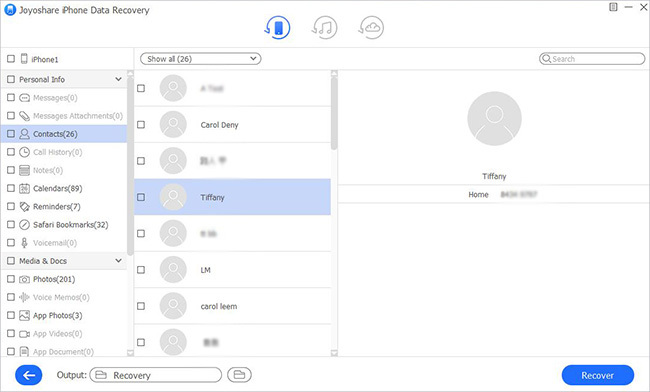 Joyoshare iPhone Data Recovery for Windows (or Joyoshare iPhone Data Recovery for Mac) is considerably worth a shot when it terms to retrieve iPhone contacts without backup. It has powerful ability to find the data in your phone to the greatest extent, let you preview scanned results in real time and help you selectively choose desired items before recovery. Other than that, it also gives you liberty to recover more 20 kinds of iOS data, not only contacts, but also photos, voicemails, notes, reminders, call history, voice memos, WhatsApp/Kik/Viber messages, etc. from iOS device (iPhone/iPad/iPod touch) directly. Aside from it, you are enabled to get deleted or lost data back from iTunes or iCloud backup without damaging and overwriting current files. All that matters is that it can fully support a wide range of iOS models with broad compatibility to the latest iOS version. Put yourself on a situation where no backup file can be used to restore lost/missing/deleted contacts from iPhone? Alright, just go to use the following step-by-step instructions; your trouble will fly away soon. Jump into details right now. 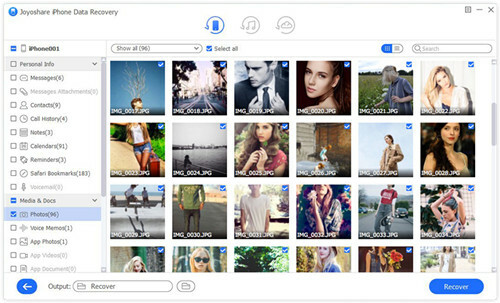 Go to Joyoshare download page to find Joyoshare iPhone Data Recovery and equip it with your computer. 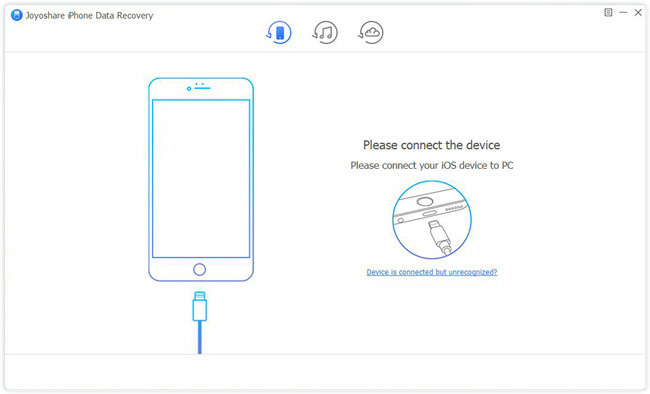 Simply launch it and connect your iPhone with an original USB cable under "Recover from iDevice" mode. You are supposed to "Trust" computer on your iPhone so that there is no further problem to detect and recognize your phone. Having connected successfully, your device info will be shown on the left side while data types will be displayed on the right part. All files are checked by default. If you only feel like to get lost contacts back, go to tick the box of "Contacts". Next head to tap on the "Scan" button at the right bottom. 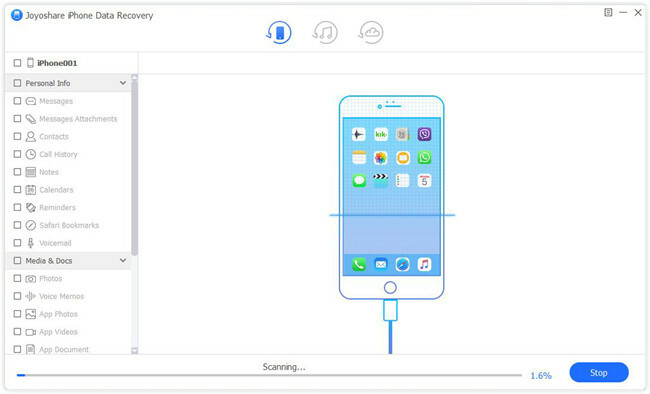 The time to scan iPhone data is closely related to the amount of your files. Wait until Joyoshare stops extracting, after which you can see both deleted and existing data classified in different categories. Go straight to check items on "Contacts". Conveniently, it's as well available to filter out needless files and only recover the deleted ones. You can also pick up more needed data you want in your own way. Then click "Recover" button to save them on computer. In the video tutorial, you'll learn how to recover lost contacts from iPhone with Joyoshare iPhone Data Recovery for Windows, even if you haven't made any backup in advance.